Q. How do I use Freading on a Nexus? If you know your library card number and PIN, visit the HMCPL website, and click on "My Digital Library" in the top left-hand corner of the screen. Click on the word Freading, and it will open the Freading platform. There will be an icon to take you to the Freading App download. OR, you may click on the link to "Google play" to download the Freading app before you get to the platform. Either way, you will be able to easily download the app. The next part is where some users get confused. You do not need to download Adobe Digital Editions onto your Nexus. Instead, you must register your ADE id once inside the app. If you do not have an ADE id, visit http://www.adobe.com/products/digital-editions/faq.html for more information. 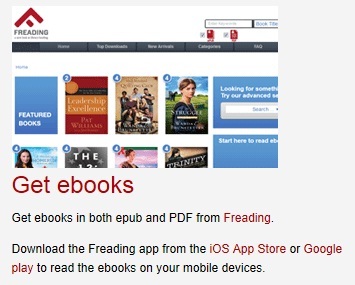 While in the Freading App, click on the "Android Device button." This button is in the bottom right right corner and looks like three dots in a vertical line. Then click on the "Account" icon. You will be prompted to enter your ADE id. Voila! You are ready to download books and get reading.